There are many symptoms of sunburn. If you begin to feel any symptoms associated with a sunburn, it is important to get out of the sun and start treatment as soon as possible. These are the most common symptoms of a sunburn. 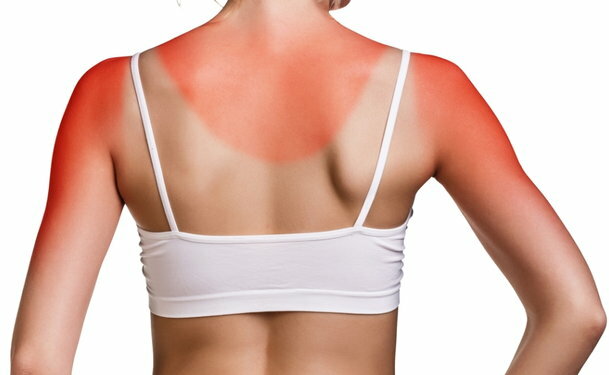 After being exposed to the sun for too long, your skin will begin to turn pink then red. This is a sure sign that a sunburn is beginning. The redness can even appear hours after being exposed to the sun. You may not feel anything until later that night. Sometimes, the signs of a sunburn will not show up for 12 hours, and may worsen for up to 24 hours. When your skin appears tan, the color comes from the melanin that your body produces to protect the skin from the sun. Some people are not able to produce enough melanin to protect their bodies. If you are light complected, you will burn very easily when exposed to the sun. When your skin is beginning to burn by the sun, it may start to swell. The swelling is caused by the blood vessels rising to the damaged area. This can become very painful depending on the severity of the burn. If you do experience swelling caused by a sunburn, taking an anti-inflammatory may help relieve some pain. Too much exposure to the sun can cause headaches. If you get a headache after being exposed to the sun, it could also be a sign of heat stroke. You may even feel like you have the flu. You may feel nauseated and tired. If you think you have developed heat stroke, it is important to drink plenty of water and get rest. After you have gotten a sunburn, your skin may peel. The skin will usually start to itch before it will begin to peel. This is part of the healing process after a sunburn. If your skin does start to itch, try keeping it hydrated with lotions or Aloe Vera. This can help reduce peeling. If your skin does start to peel, do not peel it off. Peeling the skin off can cause it to hurt worse, and in more severe cases, cause infection. If you have ever experienced a sunburn, you know how painful it can be. The pain can be caused by the inflammation of the skin or by the burn itself. If the pain is too intense, an over the counter pain reliever can be used to help you be more comfortable. In the most severe sunburn cases, blisters may form. This is most common in people with fair skin. The blisters can pop and a pus-like or watery discharge may come out of the blister. There are many symptoms of a sunburn. These symptoms can make your life miserable until the sunburn heals. It usually takes 4 or 5 days for a sunburn to heal. To prevent a sunburn, it is important to reduce sun exposure and wear sunscreen.